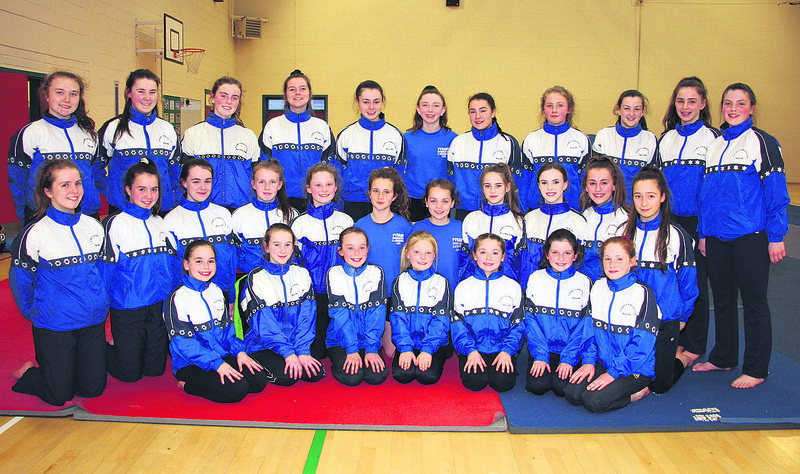 Members of Pyramid Gymnastics and Acrobatics Club who are travelling to Swansea this weekend for an international tournament against teams from Wales, England and Ireland. Photo, S Murphy. 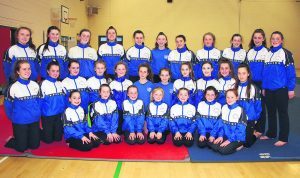 26 members of Pyramid Gymnastics and Acrobatics Club travelled to Clondalkin, County Dublin recently for a friendly acrobatics event. The club was well represented, with gymnasts in Level 2, 3 and 4, competing against clubs from Monaghan, Galway, Dublin and Cork. The girls showed great composure, with their very polished and elegant routines comprising of high climbs, backflips and aerial cartwheels to name a few. Pyramid gymnasts came out on top, winning the gold medal in the girls grade 2 womens group consisting of Amy McCormick, Zoe Tiburzi and Nicky Sheehan. This was followed very closely by teammates at the same level gaining silver with Amy O’Donoghue and Clodagh Britton. Our best event was the grade 3 women’s pairs and women’s groups. Pyramid ran away with this event, Sarah Jane Clifford and Ciara Buckley scoring the highest of the day and winning the prestigious cups along with the gold medal, again followed very closely behind in the silver medal position by Anna Clifford and Katie O’Mahony. Our trios won gold, silver and bronze respectively, with the trios consisting of Holly Garvey, Lucy Lynch and Louise O’Leary. These girls had a fun, quirky and well-balanced routine. Silver position was won by Chloe Savage, Niamh O’Donovan and Clara O’Riordan whose creativity shone through from start to finish. And finally, the bronze medal position was won by Niamh Cronin, Lauren Sheehan and Ava Darcy. The girls have been working really hard towards this competition, making the necessary adjustments to their routines as they are travelling to Swansea in Wales this weekend to compete against a number of clubs from Wales, England and Ireland. Each group must perform one routine to instrumental music of choice. The routine can last up to 2 minutes and must include the necessary requirements for each level, including choreography, balances and gymnastic elements. This is a great achievement for all of these gymnasts and we wish them all the best of luck.